The colourful coral and tropical marine life have always been one of the biggest Great Barrier Reef attractions, however there's a new buzz on the World Heritage listed natural wonder. A unique manta ray has been spotted in the waters around Lady Elliot Island in what has been dubbed an Australian first by scientists. Spotted in the southern Great Barrier Reef, the manta ray caught the attention of an experienced dive instructor with its unique pink underbelly. 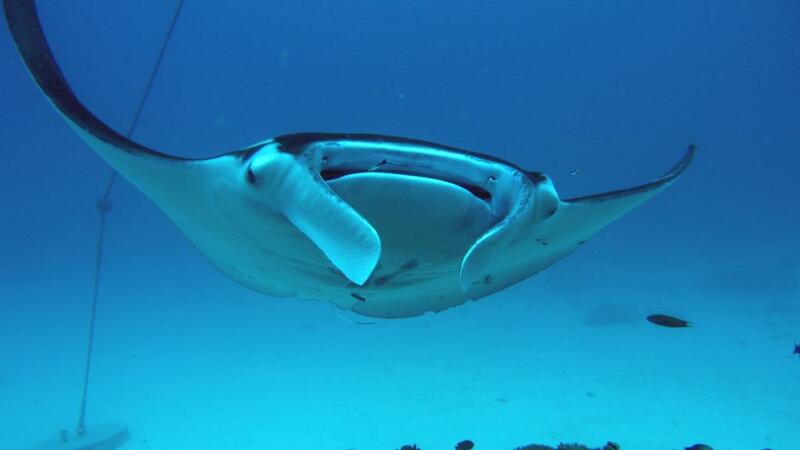 Leading a group dive, instructor Ryan Jeffery noticed the ray with its discoloured underside and immediately began taking pictures and recording video. Having been diving the waters of the Great Barrier Reef for five years, Mr Jeffery said this was the first time he'd seen anything like it on his thousands of dives. Usually white, the underside of this particular manta ray was a strange, discoloured dusky pink. Upon returning from the dive, Mr Jeffery shared the images and video footage with his colleagues who contacted scientists involved in Project Manta. Lead scientist Dr Kathy Townsend said the manta displayed a 'very curious' colouration and that it appeared to be a mature male. The reason for the bizarre if not beautiful discolouration was not immediately clear, however scientists speculated it could be due to stress or a skin infection. Ryan Jeffery, the dive instructor who discovered the unique manta ray, questioned the theory that the ray was stressed, stating that the creature was very interactive with the group and hung around for about 30 minutes, casting doubt on whether the pink hue was stress-related. Another theory the scientists explored was the possibility of a certain type of skin infection, which has caused similar sorts of skin discolouration with manta rays in Mozambique, off the coast of Africa. While the skin infection is the most educated guess so far, Mr Jeffery has been spending his time in the water hoping to catch another glimpse of his uniquely coloured companion but has so far been unsuccessful.